Son of Malcolm and Margaret Macaulay, 16 Carloway. "He had been attached to me for duty on the ammunition dump for the past four months or so, and it is with the deepest regret that I have to acquaint you with the sad news. 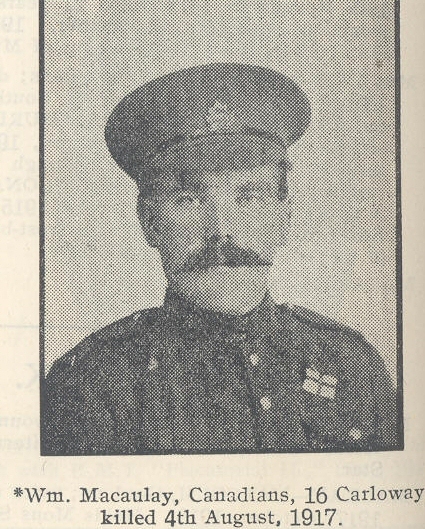 Your brother was killed by a German shell whilst going about his duties on the night of the 4th August 1917. I am pleased to say that he suffered no pain as he was killed instantly. His body was buried in a little French town behind the lines, a service being held over the grave at which a large number of his friends attended. His loss is felt very keenly by everybody who knew him, as he was always a good friend and companion, and for my part I always found him very attentive to his duties. We have lost a good soldier". "He was a good soldier, and showed splendid devotion to duty. His loss is keenly felt by all ranks of his company, and particularly his platoon comrades, with whom he was deservedly popular. Assuring you of deep sympathy".